Tarantulas are hairy massive spiders that have a rather intimidating public image. Once you are aware of exactly how tarantulas consume their prey, you may understand all of the hype. The carnivorous creatures use their venom as a means of securing prey for upcoming yummy meals. The tarantula approach to eating is a rather fascinating and unconventional one. The first step entails placing the razorlike fangs into the prey. Ouch. With one bite, the tarantula effectively renders the prey motionless. Digestive enzymes transform the prey into a liquid through deconstruction of soft tissue. Only then can the tarantula, which is unable to eat solids, dine on the prey by sucking it up. The amount of venom a tarantula needs to stop prey is minimal. If a tarantula isn't too hungry at the time and wants to store away his prey for consumption later on, he may conceal it in silk. A wide array of animals are frequent victims to the unconventional and frightening tarantula. Smaller tarantulas predominantly eat fellow bugs, such as cicadas, crickets, grasshoppers, sow bugs, caterpillars and beetles. They also sometimes eat other varieties of spiders. Some examples of larger tarantula prey include lizards, snakes, bats, toads, frogs and rodents such as pinky rats and mice. 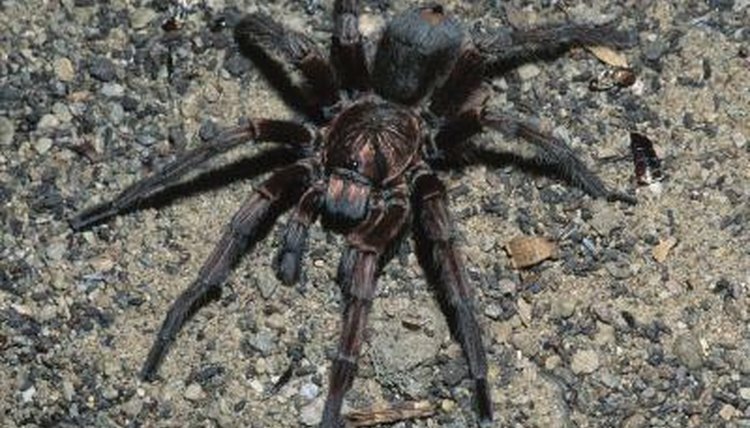 Certain varieties of tarantulas -- think the Goliath birdeater -- often also consume hatchlings and birds, hence the fitting moniker. Once the nocturnal ambush predators are through slurping up their unsuspecting prey, they often leave behind empty "shells" as evidence of their mealtime victories. If a tarantula happens to enjoy a particularly big meal, he will likely be satisfied for quite a while. He may not have the need to consume anything else for a month.